Olivia Clayton has mastered the art of tearing others down to stay on top. She and her best friend, Adrienne, rule their small southern town like all good mean girls do—through intimidation and manipulation. After Olivia suffers a family tragedy and catches Adrienne sleeping with her boyfriend, Olivia is over it. She decides to make a change, but it's impossible to resist taking down Adrienne one last time. Up to her old tricks, Olivia convinces golden boy Whit Du Rant to be her SAT tutor and her fake boyfriend. But when it starts to feel real, Whit gets caught up in Olivia and Adrienne’s war. Olivia may ruin everything she touches, but she won't go down without a fight—not if it means losing Whit. And definitely not if it means losing what's left of herself. 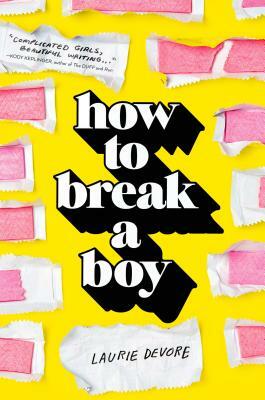 How to Break a Boy is an engaging young adult novel from debut author Laurie Devore. Laurie Devore was born and raised in small town South Carolina and graduated from Clemson University. She now lives and works in Chicago, where she misses the charms and contradictions of the south every day. In her spare time, she reluctantly runs marathons, watches too much TV, and works a "y’all" into every conversation. She is the author of How to Break a Boy.